The Highways Agency has been presented with a Milestone Award from the Considerate Constructors Scheme for having 1000 sites registered – a first for construction clients in the UK. 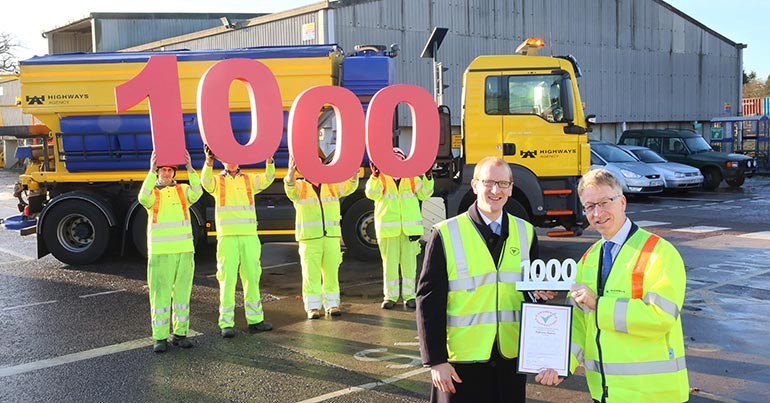 The award was presented by Edward Hardy, Scheme Chief Executive, to Graham Dalton, Highways Agency Chief Executive, at the 1000th Highways Agency registered site – Blunts Farm Depot in Theydon Bois, near junction 27 of the M25. Approximately 70 people work at the depot, run by Connect Plus Services on behalf of the Agency, which provides maintenance and winter support for the M25 and M11. I’m delighted to accept this award on behalf of the Agency and our partners in the supply chain. We work hard to minimise disruption for drivers and limit disruption to our neighbours who live near our road network whenever we carry out maintenance or improvement work. Customer service will continue to be a priority as we prepare to become Highways England. Through better planning, improved safety and engagement with our customers we will deliver £11billion of investment in our network with minimal disruption. I would like to congratulate the Highways Agency for registering 1,000 sites with the Scheme, which demonstrates their commitment to improving the image of construction. The Agency and their partners have worked hard to ensure disruption is minimised and local communities are respected when work takes place. They are of great credit to the industry and we value their continued support. All of our depots have been registered with the Considerate Constructors Scheme as it’s important to us as a business. The main categories within the Scheme are all key themes within our Business Plan for the next five years; with customer focus and safety being high priorities. The Scheme is a non-profit organisation that works to improve the image of construction. All registered sites, companies and suppliers adhere to the Code of Considerate Practice which requires them to care about appearance, respect the community, protect the environment, secure everyone’s safety and value their workforce. Customer service is a priority for the Agency and will be emphasised when it is replaced by Highways England in April next year. The Strategic Business Plan 2015-2020 aims to improve customer service by planning roadworks better, providing better journey information and building stronger relationships with customers and communities. The Agency will continue to register sites with the Considerate Constructors Scheme. The Agency is also a member of the Institute of Customer Service which provides specialised training and best practice guidance.